Find out what the standard tuition charge is for American schools, and how Brown Mackie College - St Louis compares. Prepare financially for your degree. Compare Brown Mackie College - St Louis' fees and tuition to typical colleges. Check for price trends and potential increases to find out whether you should budget for more resources for the next 4-6 years of paying for college. How Does Brown Mackie College - St Louis Measure Up To Other Schools? The subsequent table outlines how Brown Mackie College - St Louis measures up to other schools nationally, regionally and by state. In the 2017 - 2018 school year, full time undergrads at Brown Mackie College - St Louis were charged $12,492, prior to modifications for financial need. From this total, the cost of tuition was $11,592. The remaining $900 represents additional fees. Unlike public colleges, Brown Mackie College - St Louis does not provide discounted tuition to in-state students. Tuition and fees cover the costs of attendance for one academic year, but don't cover room and board, which will be an additional cost you will get when living on campus. Keep in mind a lot of students will get financial aid and scholarships which minimize their total cost. View Brown Mackie College - St Louis cost per credit hour here. Brown Mackie College - St Louis tuition and fees have remained steady in the past five years. We anticipate the cost of fees and tuition this year will total $12,403. If prices remain constant, two years at this school will run you $24,719 and four years will run you $49,087. On top of that, you may have additional costs such as room and board, books and, transportation. 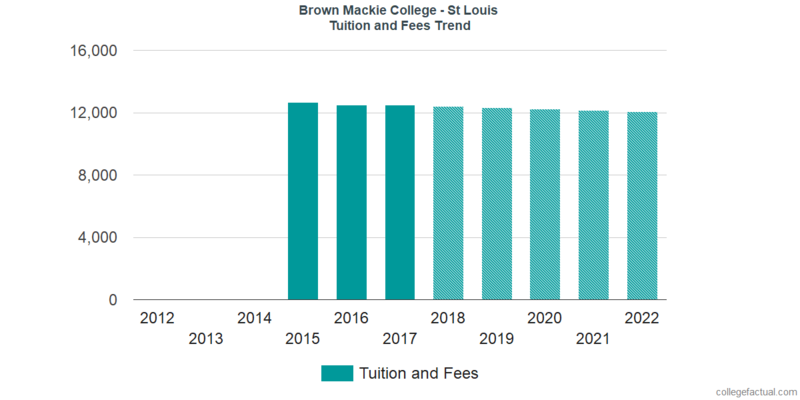 The next chart displays predicted future fees and tuition for undergrads at Brown Mackie College - St Louis. Because of inflation along with other factors, the price of college tends to grow every year. For this reason your final year of college might be much more than your initial year. Get our answers to frequently asked questions and more information about college tuition and fees.